Persistent failure to eat adequately for a period of at least one month which results in significant loss of weight or failure to gain weight is feeding disorder. It demonstrates one or more of the following: unsafe or inefficient swallowing, growth delay, lack of tolerance to food textures and tastes, poor appetite regulation, and rigid eating patterns. Swallowing disorder is a specific type of feeding disorder in which child exhibits unsafe or inefficient swallowing pattern that undermines feeding process. Pediatric rheumatology deals with the clinical problems involving childhood arthritis, non-inflammatory joint pains, autoimmune diseases, soft tissues, vasculitis and heritable connective tissue disorders. This focuses on the well being of infants, children and adolescents. General paediatricians are doctors dealing with the health of a child, including physical behaviour and mental and emotional well being. Drug use in Pediatrics population is rising because of improved diagnostics and therapies. They diagnose and treat several conditions like injuries, infections, organ diseases and dysfunctions, cancers, genetic and congenital conditions. Pediatric emergency medicine specialises on full spectrum of emergency illnesses, critical Pediatric physiology, deformations and interventions to help EMS practitioners to provide the treatment for sick and injured children. 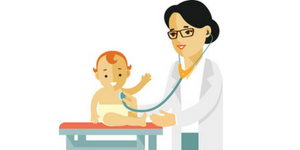 Pediatrics critical care has been a development in ventilation and resuscitation, anaesthesia and anaesthesiology, physiology and anatomy, neonatology, Pediatric general and cardiac surgery, and Paediatric cardiology. Improving emergency and critical care in pediatrics significantly reduces mortality. It focuses on the assessment of children to ascertain their developmental status. This would include learning difficulties, diagnosis of attention deficit hyperactivity disorder, speech and language delay, social communication disorders, including the diagnosis of Asperger’s syndrome and autism. A Developmental-behavioural paediatrician objective is to recognise and foster therapy for children, adolescents, and their families with a broad vision of developmental and behavioural difficulties. Craniofacial anomalies are a diverse group of deformities that affect a child’s health and facial bones. Factors that may contribute to the development of craniofacial anomalies include combination of genes, environmental (i.e. a direct correlation between any specific drug or chemical exposure), folic acid deficiency. Most common types of pediatric craniofacial anomalies are Cleft lip and/or cleft palate, Cleft lip, Cleft palate, vascular malformation, Craniosynostosis, haemangioma, Hemifacial microsomia, Deformational (or positional) plagiocephaly. Pediatric neurology is a therapeutic subspecialty with special expertise in diagnosing and treating disorders of children who have seizures, head injuries, or muscle weakness. Child neurologists work with different pediatric specialists to diagnose and assess children who have extra complex or serious medical issues, such as birth defects, epilepsy or mental retardation and these are persistent conditions that need ongoing care and close follow-up throughout childhood and adolescence. Kidney problems in children are common and can occur due to developmental birth defects. Pediatric Nephrology deals with the diagnosis and management of children with a variety of acute and chronic kidney related disorders. It also deals with hypertension, proteinuria, nephrolithiasis, haematuria, renal tubular acidosis, glomerulonephritis, kidney failure and contributes comprehensive care for paediatric patients with end-stage renal disease, including care to patients undergoing peritoneal dialysis, haemodialysis and follow-up care after kidney transplantation. Hormones play a vital role in driving a child’s growth and development. Problems with growth, puberty, and sexual development often have their roots in the endocrine system. Children are growing individuals and they have special needs related to growth and development. Further, their psychological needs are different from those of adults. Hormone problems affecting growth or sexual development can have significant effects on a child’s physical and emotional well-being. Pediatric endocrinologists are sensitive to these issues. It is concerned with diseases of the heart in the growing and developing individuals. Abnormalities include congenital heart disease, arrhythmias, all types of coronary illness in neonates, infants and adolescents and disturbances of circulatory function and the physicians are expertly trained to deal with diagnostic tools including electrocardiography, echocardiography, and cardiac catheterization and electrophysiology studies. The division of Pediatric Hematology focuses on comprehensive care for children and teens with blood cell diseases, bleeding and clotting disorders, and blood cancers. Pediatric oncology is the research and treatment of cancers in children and young adults. The types of cancers that develop in children are often different from cancers that develop in adults. Childhood cancers include brain and spinal cord tumour, leukaemia, lymphoma, neuroblastoma, osteosarcoma, retinoblastoma, rhabdomyosarcoma, wilms tumour, Ewing sarcoma.